Even before wore the costume the curlers were falling off. I have ordered many costumes in the past and this was horrible. The curlers were dropping everywhere during the day. The costume fit my body well really flowy but it is more see through than I anticipated. Also, the headpiece is too small to fit on my head but I do have a big head so I will have to make arrangements to accommodate. Overall...I like it and it achieves the look for the costume party I wanted. Would purchase again. Cape was great, but the rollers kept falling off of the cap. I used a glue gun once to add them back but they fell off again. I ended up sewing the curlers back on. Cap was also very small. I'm tall and small (5'11", bust 30, w 25, h 36) and the small fits perfectly! 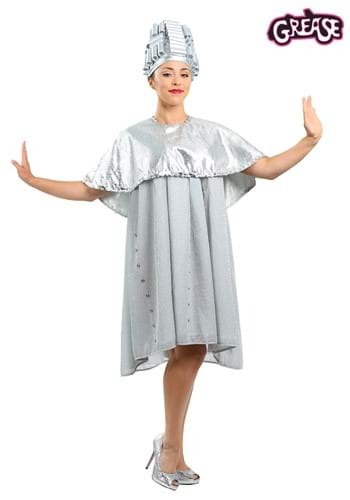 I purchased this for a work Halloween costume competition and ordered silver dance shoes off of a different site; it's length appropriate (3 inches above the knee, long legs and all) and feels comfortable to wear. It's not see through nor terribly itchy (may need an undershirt). Got a lot of laughs from my family!! Saw a live performance of the show in New York in 1974. Costume is great. Now, if only I could find a group of friends who would be agreeable to going as a group -- and who were able to sing! Absolutely love it! And, so much cheaper than other sites. Wish you would have had all the grease costumes we wanted.